We are a group of singers under the musical direction of Mark Bradley. Based in South Warrington, we were originally known as St Wilfrid’s Consort, but marked our 25th anniversary by becoming the Bridgewater Singers, a name which reflects our local roots. 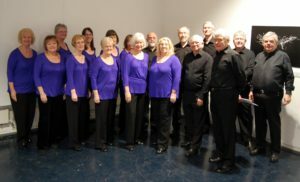 We began life as a small madrigal group of eight voices, formed to provide quality music for the 800th anniversary celebrations of St Wilfrid’s, Grappenhall. Since those beginnings, when the eight founding members were active in the church’s life, we have gradually expanded to eighteen voices and no longer have any formal link to Grappenhall church. Our raison d’etre therefore changed: accordingly we have broadened our repertoire to include traditional English songs, a capella and songs from the shows whilst retaining our love of performing sacred music from the medieval period right up to the present. Our programmes take us through the great classical composers to modern writers such as John Rutter, Eric Whitacre and Morten Lauridsen. We perform regularly in Lymm and Warrington as well as further afield in Cheshire and Merseyside. Many of our concerts are given in aid of local charities, but we also sing at weddings, at festivals including those in Lymm and Stockton Heath and at church services throughout the area. We also sing at special events such as Carols at Arley Hall and Tatton Hall, fundraising for Warrington Young Musician of the Year at Warrington Town Hall and at summer concerts at Tabley House.